There is no hiding it any more. I'm a slave to fashion. Looks over substance, surface over content. I was all set on the Let's Note N9. It's nearly perfect; lightweight, reasonably fast, good screen, long battery life. And refreshingly, there's no cd drive in it. I use cd's about once per computer - when I install Linux - so carrying one around just doesn't make much sense. There was just one thing about the machine: the color. It's grey. Plasticky grey. Depressingly grey. The kind of grey you associate with office equipment in a dystopian nightmare. It's a set of nicotine stains away from being a prop in Brazil (see that movie, by the way. It's good). Now, it has a sister machine, the S9. It's all but identical to the N9, except it has a useless CD drive that makes the machine a bit more expensive and slightly (about 60 grams) heavier as a result. Oh, and if you add another smallish chunk of money you can get it in black. A smooth, cool semi-matte black. The kind of black an Evil Overlord would use for all equipment in their secret underground lair. So a near perfect machine that is the wrong color, or a slightly less perfect, slightly more expensive machine that looks spiffy. No points for guessing which one I got. Panasonic Let's Note S9, in black. Does it look good or what? Design is important. Looks do matter. How we perceive our tools affects how we think of them, and that in turn affects how we use them1. I'm going to be staring at this computer for many hours a day, every day, for the next three or four years and I don't want to spend all that time being irritated by the color. The price difference is not large (about 15k yen), and the extra weight is negligible. You can shut off the drive in the bios so it never drains any power at all if you don't want to use it. And did I mention how the black looks really great? So, apart from the color, what's it like? It's a size larger than my previous notebook. That means the keyboard is full size, and while the R-series keyboard is fine - I've done all my writing and almost all programming on one for the past six years - this keyboard is a bit easier to use. It has the same layout and retains the same excellent feel. The screen, too, is larger of course - that's the main reason I went up a size after all - and the image quality looks like it has improved. But of course, I'm comparing a brand-new screen to an old, heavily used one with a dim backlight and fading colors; it'd be rather bad if it didn't look better than that. It's a matte screen of course2 with an LED backlight (shouldn't fade over time like fluorescents do). The extra screen space makes a big difference for programming (where you want to fit as much information as possible) and image editing, but not that much for writing. It's difficult to read long lines of text so a wide screen is mostly useful to fit bits of reference information on-screen along with your text. The larger size means the machine is larger (um, ok, surprise). The footprint is A4-sized so it's still not huge. The increase doesn't seem to have any practical downsides so far, though I've yet to find out how much of a problem it becomes in an airplane. At 1.3kg this is still a very light machine (the Lenovo I was considering is half a kilo heavier, and a Macbook Pro would add almost a kilo) but the extra weight compared the R is noticeable. It feels exactly like bringing an extra book in my backpack when I go to work every morning. It's not a problem, it's certainly not annoying, but if you really want to travel light you might want to look at the R-series or a netbook instead. The machine is fast - clearly, obviously faster than my previous R-series notebook. Of course, that one's three years old, has half the memory, a 32-bit OS, a third of the clock speed and no active cooling so it's not surprising. More surprising is that the S9 is as fast as my home desktop and large work machine for single-threaded applications, which includes just about all everyday stuff we ever do. I'll elaborate on this in a later post. The extra speed means more power use, which means more battery drain and a hotter machine. A larger battery accounts for a fair amount of the extra weight of this machine, so battery life is good - it lasts 6 hours, as long as the R did, even without any powersaving features enabled. The S9 has a fan, unlike the R that didn't have one, making it completely silent, but leading it to overheat if I stressed it. The fan is very quiet, though; in normal use it's virtually silent, and even when it's working hard it never gets loud or distracting. I use Linux - the newly released Ubuntu 10.4 "Lucid Lynx" - like I do on most machines. Nowadays I always install the 64-bit version. You need to if you want to use 4Gb or more memory, and 32-bit compatibility is good enough now that there's just no reason not to use it anymore. The S9 came with Windows 7 and I started trying to set up dual-booting, but Windows was being cranky about resizing itself so I quickly gave it up and replaced it altogether. I have yet to use my dual-boot Windows installation at work after more than a year, so it's clearly not a very high-priority item for me. Overall, the installation went without a hitch. Pop in the installation disk, answer a couple of questions and an hour later you have a shiny brand-new Ubuntu installation. There's some useful tweaks I do, for things like making a Japanese keyboard work with a Swedish layout (Japanese keyboards lack the "< > |"-key to the left of "z" for instance); I may write a separate post about that. While the initial setup is fast it does take a long while to move all the data and stuff from the old machine and reinstall all applications you depend on. I take the opportunity to clean out and sort all my stuff when I change machines so there's no way for me to do it automatically. Most things just work out of the box. 3D acceleration, external monitor, sound, video - it's all there the first time you boot up. But it's brand-new hardware (Intel i5-520M, QM57 express chipset and Wimax 6250 wifi), and a brand-new OS version, so there's a few issues. I can't change the backlight level; there's a graphics driver bug that will kill the desktop if triggered (it has happened twice this past week); and Intel has yet to release the firmware bundle needed for the wifi. I'll sort out the backlight setting and report the graphics driver bug to the developers the next time it happens. Both are probably pretty simple fixes. Intels delay in releasing the firmware is pretty annoying though. Wifi is a convenience rather than a necessity for me at the moment so I'm willing to wait, but if it takes too long I'll either have to do some workaround using the Windows drivers or use an old wifi adapter I have lying around. Overall, it's a very pleasant machine. It hits the sweet spot for me between size and power, and of course, it looks great. Once the remaining issues are sorted out it will be pretty much perfect. #1 You'd think, for instance, that a country's military forces are ruthlessly utilitarian, but even they think about perception. When the Swedish army was moderinzing their uniforms in the 1990's, studies had shown that a solid green was the best color for the Swedish terrain. They nevertheless settled on a camouflage pattern, because the slight difference in effectiveness was more than offset by the improvement in troop morale and self-confidence from wearing a cool-looking pattern. Also, army vehicles and weapons always seem to get names like Leopard or Black Hawk while names like Fluffy Bunny or Bambi are notably rare. #2 Glossy screens look great in the store, with deep blacks and vivid colors - that's why some makers go for glossy of course, since they sell well. 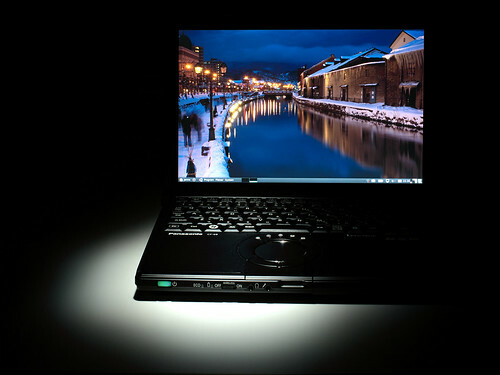 But the screens act as mirrors, reflecting everything bright or light-colored facing the screen. That means you'll spend your working days looking at reflections of your own face and hands, the ceiling lights, windows, other people's desk lamps, bright walls, alien abductions and so on. It's not only distracting, but it's actively harmful if you do something that needs good color or brightness rendition, such as when you edit pictures. The reflections change the perceived contrast and color where they fall, and getting the image right becomes pure guesswork. You increase contrast in one area, only to realize that there was a sunlit wall reflected there, and now the contrast is too much. Sure, you could kill all lights, cover the windows and - I don't know - wear a ski mask and gloves I guess, but it seems easier to simply get a good screen instead of rearranging your life to suit a bad one. hi came across your site looking to install ubuntu 10.10 on my panasonic s9. i was wondering if the problems you mentioned such as wifi and backlight were fixed in the later releases. also, a crazy coincidence but i happen to live in osaka as well! Ubuntu 10.10 mostly works - I use it as my everyday system. Wifi works just fine now and it's very stable. The only annoyance is that the backlight control still doesn't work. There's open bugs on that both in Ubuntu and Debian, but no fix yet. Probably fairly easy to fix, but I have no clue how to do it myself. Fortunately the backlight issue is just a little annoying, nothing else. The machine is perfectly useful even without that control. So you should be able to install it just fine I think.